﻿ Surge protection device (surge arrestor) work principle - Technical Support - Fatech Electronic CO., LTD.
lightning surge protection system's main role is to protect electronic equipment from the "surge" of damage. So, if you want to know the role of the surge protector, you need to find out two Question: What is the surge? Why do we need their electronic equipment protection? Surge or transient voltage is the voltage in the power flow of the process significantly more than the rated level. For power supply systems, in three phase four wire system, the surge arresters is connected both between the three phase wire and the earth wire, in normal situation, the impedance of SPD is very high and no current follows through it. But when the power lines are stricken by lightning or produced high transient voltage by induction or other reasons, SPD will be immediately response within nanoseconds and cause the surge current to flow down to the earth, thus the equipments connected to power network are effectively protected. 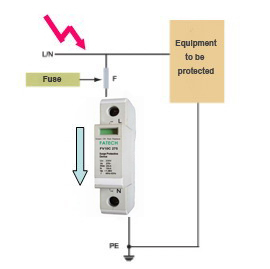 Fatech Electronic (CHINA) LTD surge protection device(SPD) have the remote alarm function; it is convenient for customers to monitor the operation state by connecting annunciator to surge protection devices (SPD)’s remote signal contact. Each surge protectors module has a visual indicating window, it is green in normal condition, when it fails its color will turn to be red, please replace the failure module. It can be used long time as long as the surge arresters doesn’t fail or turn to be red. Modern electronic devices (eg, computers, microwave ovens, DVD players) are very complex, many of which components of the machine components than the previous smaller and more sophisticated, so they are more sensitive to the current increases. The microprocessor is a computer and many household appliances of all indispensable components, their surge in particular sensitive. Only in the normal voltage, current stable conditions in order to work properly. Therefore, it should install lightning surge protection depends on the type of equipment connected to the power supply. There is no reason for the surge protectors installed a light bulb, because the surge could cause the worst outcome is blown filament. The computer should definitely use the surge arresters. Voltage sensitive components in your computer easily surge damage. At a minimum, this damage will shorten the computer life, and can easily remove or damage any data stored in the system. The computer is a very expensive item, the data stored in it is often impossible for generation, so the most economical way is to buy high-quality surge protection device(SPD). Best for other high-end electronic equipment (for example, entertainment center with the equipment) to install surge protectors. In general, the surge protectors can extend the equipment life. However, there is always a strong surge likely cause serious damage to equipment.